There's an ongoing debate among fitness professionals about the extent you, as a PT can help your clients with their nutrition; what’s within the scope of an average personal trainer and what type of nutrition support requires further qualifications, potentially even a university degree. We’ll dig into the scope of practice from a nutrition point in part 1 of this mini-series. Do Personal Trainers Have to Give Nutrition Advice? Absolutely not. Would it be beneficial if they did? That depends on the client’s goal and their current level of nutrition knowledge. If your niche is in fat loss, weight loss, physique and even general fitness, chances are, a good few potential clients can do with help in the nutrition area. You can still decide that you only want to focus on their training and refer them to a nutritionist, but it will be vital for them to understand, that exercise alone won’t get the results they desire if they don’t watch their food intake. Are Personal Trainers Legally Allowed to Give Nutrition Advice? Well, that depends on the advice you give and how you deliver it. So, it’s a little bit complicated and is a grey area due to the lack of regulations in the fitness industry. Let’s look at the different types of nutrition support clients can receive and who is able to provide that for them. We start with food prescriptions because this is the one area that’s crystal clear. Only Registered Dietitians are covered to provide detailed meal plans to their patients, that include portion sizes, specific macro-nutrients and micro-nutrients, supplements and meal timings. In the UK, one can only become a practising dietitian once registered with the Health and Care Professionals Council (HCPC), but the system is very similar in other countries too. 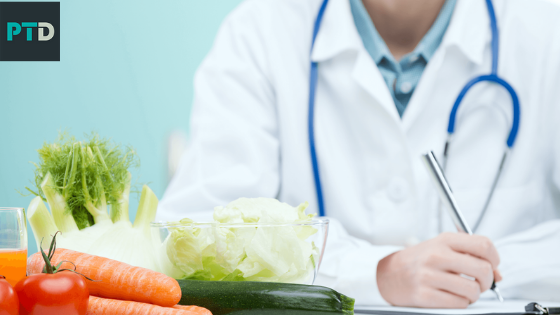 To be accepted, an RD must first complete a BSC (Hons) degree in dietetics or a Masters if they already have a degree in a life science subject. They are required to stay on HCPC for as long as they want to practice their profession and they need to keep updated with research and CPD as well as pay an annual fee. Any trainer offering mapped out meal plans to their clients without being an RD is overstepping their scope of practice. Of course, unless a client develops symptoms or a medical problem, you probably won't get into trouble if you are doing that. However, would it really be worth the risk? Even the best insurance providers won't pay up if they find out you have offered a service for which you don't have the required qualifications. This is where an average personal trainer sits without any further nutrition qualifications. Think about the personal trainer course you completed and how much nutrition knowledge you gained from it. The Eat Well Plate, the Food Pyramid and those principles you have learnt can all be passed on to your clients with the references. From experience though, personal trainers learn tens of times more about nutrition in their first year of being in the profession than on their course; so long they are open to reading articles and following organisations like the NHS, Diabetes.org, British Heart Foundation by just reading all the free resources available. You can also start checking on new research results via portals like examine.com or sciencedaily.com. Knowledge is now available freely on the internet, so long as you know where to find it, but that doesn’t mean you can re-package it as a service and charge people if you don’t have credentials. The best a personal trainer can do without any relevant certificates is to point clients to the direction of trusted resources and let them make up their mind about what would work best for their lifestyle and preferences. Or you can refer them to a nutritionist, to their GP or a dietitian depending on what level of nutrition support they require. Think about food logging, habit coaching, macro-nutrient calculations, daily calorie intake advice, grocery lists, supplements and the like. This is the grey area of debate where most personal trainers who offer nutrition support may operate, but it’s harder to decide whether it’s within their scope or not. Again, If you don’t have some form of nutrition qualification beyond that taught in the personal trainer qualification, you will likely have to stick to very basic advice that is backed up by government guidelines. If you do have additional nutrition qualifications you should be alright giving more educated nutrition advice but make sure to follow what was in your courses rather than give advice from something you read in a magazine or article. It's still worth checking with your insurance provider though to make sure your fully covered. Supplements are a different story, in general personal trainers are not covered to give specific supplement advice to a client. Stick to general terms such as, “this protein powder has been show to improve recovery and muscle growth with resistance training”, rather than specifics like “you should take 10 capsules a day of this fish oil as it will improve your insulin sensitivity and help you drop fat quickly”. How Does It Translate into Online Personal Training? When you take an already non-regulated matter to the internet it adds extra complication in terms of law and insurance, but the main principles listed above still apply. The bottom line is, it's great to help clients with their nutrition but only give the advice you're qualified to give. How Can a Personal Trainer Offer Nutrition Services? We will elaborate on this question in detail in part 2 so you can explore a few options. We will also explore course providers who specialise in helping fitness professionals to expand their nutrition knowledge so they can offer more of a nutrition coaching service; we will also discuss ways to outsource the nutrition part of your services to professionals skilled in that area.